For the puppy in need of a name around the middle of March, we have put together a list full of Irish ales, the color green, and holiday symbolism. Spend less time debating over your dog’s title and more time drowning the shamrock. Saint Patrick’s Day is a celebration of color. Each year on March 17th the streets are filled with a mixture of fun and practical green attire. What many people don’t realize is that blue is the original color of Saint Patrick. The association with green came at a later point in time. Don’t worry, the transition was over a century ago leaving us plenty of time to get the memo. Among our festive names you will find several green themed ideas like Jade and Emerald. If green doesn’t hit the spot, perhaps the alcohol will. As legend would have it, Saint Patrick encountered a stingy bartender that poured him a partial cup. Patrick proclaimed that a devil was residing in the barkeep’s cellar and was causing him to be covetous and selfish with his ale. Upon return he found that the barkeep had changed his ways and the cups around the bar were now filled to the brim. Somewhere along the way the entire message of the legend was lost except for the alcohol. Today drinking and Saint Patty’s Day go hand in hand. If you stick with the beer, you might like the names Guiness, Beamish, or Murphy. Any true Irishman will likely go the whiskey route with something more along the lines of Jameson or Bushmill. Still other ideas come from a variety of symbols that relate to the holiday like the leprechaun or the shamrock. Do you feel lucky? Perhaps your pot of gold can be found within this list. I wouldn’t count on it though. You’d be much more likely to find a fitting name for your new puppy. Some of our pages will contain a subcategory. A subcategory is a slightly more specific grouping than the main topic of the page. For a subcategory, we will include a separated table of names and corresponding descriptions. An example of a subcategory of Red Dog Names would be 'Dog Names Inspired by Red Wines'. 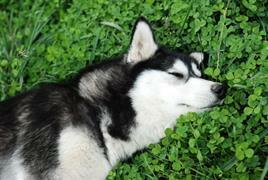 If you have any subcategory ideas for the Saint Patricks Day Dog Names page, we would love to hear them. Use the form below to submit your ideas.